Paris Deco Off is one of the annual highlights in the Jim Thompson calendar. It is an opportunity for Jim Thompson, alongside over 100 other brands, to welcome visitors to their showrooms in Paris and showcase their new collections. Interior designers, the international press and the general public are invited to view all the newest designs and scrutinize the latest trends which are conveniently located in one place, over four days. 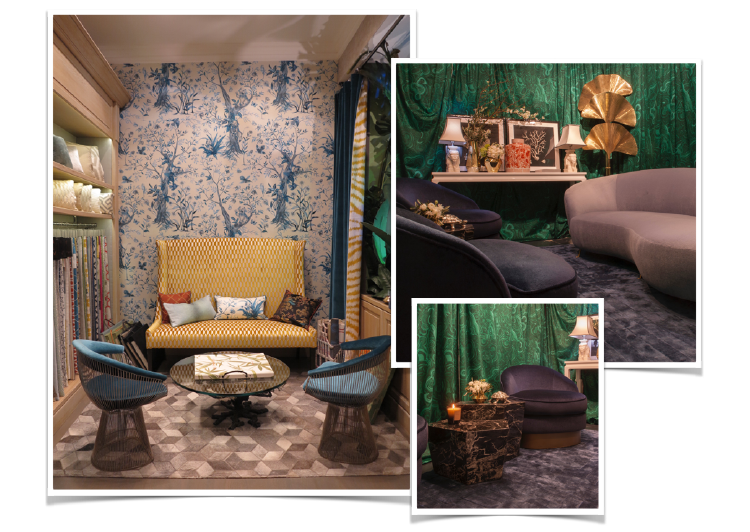 This years Paris Deco Off took place between 19th-23rd January and with it being such an important event for Jim Thompson, we thought we could provide a taste of some of the highlights during our busy time there. The team arrived from Thailand to set up and prepare the showroom. Although the actual event did not start until Thursday, there was much to be done in terms of preparation. The new collections were shipped all the way from Thailand, needing to be arranged and hung. Freshly upholstered furniture, showcasing the latest fabrics, was delivered and arranged. The press kits unpacked as the team got ready to welcome visitors from all over the world. The preparations continued, the extremely talented and renowned window display designer Douglas Little flew over from America with his creations to install in the showroom window. Exquisite animal sculptures were brought to life before our eyes, made solely from Jim Thompson velvets. Douglas worked tirelessly, adding the finishing touches to his masterpiece from the showroom. Jim Thompson held a day of important design meetings with the international Jim Thompson teams who flew in from Atlanta USA, London and Munich. With our departments being spread across the globe, meetings like this in Paris are crucial to discuss future collections and to gain feedback and insights from every side of the business. The intimate discussions were held at the Parisian home of Jim Thompson’s Assistant Managing Director, Eric Booth. Design presentations on the newly launched collections were given by the Creative Director of Jim Thompson, Ou Baholyodhin; the designer of No.9 Thompson, Richard Smith; and the designer from Fox Linton in London, Kathleen Butler. 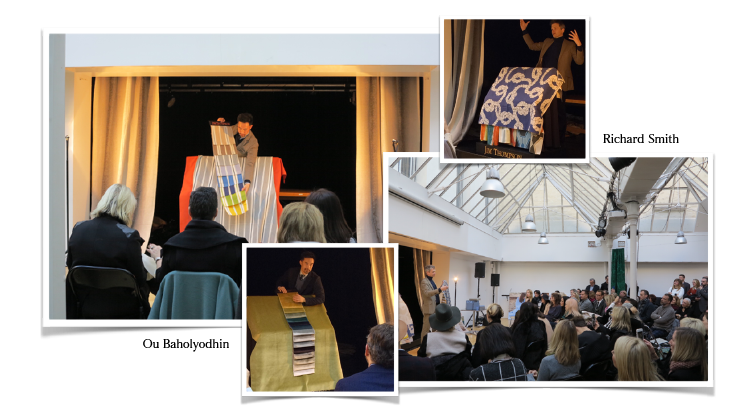 This year the presentations were held at Le Centre Culturel du Crous de Paris, which hosts a wide variety of events, concerts and interesting exhibitions, making it an ideal location for back to back meetings and presentations. In the evening, a private event was hosted especially for Jim Thompson’s French reps at the Centre Culturel du Crous. The Thai press arrived and were given a warm welcome from the whole team. This year, Jim Thompson were honoured to welcome the Thai press for the first time and had the privilege of giving representatives from some of the best publications in Thailand a special insight into how our business works in Europe. Paris Deco Off officially started. Jim Thompson were finally able to welcome visitors to the showroom and share fabrics from the new collection and the stunning window display by Douglas Little. 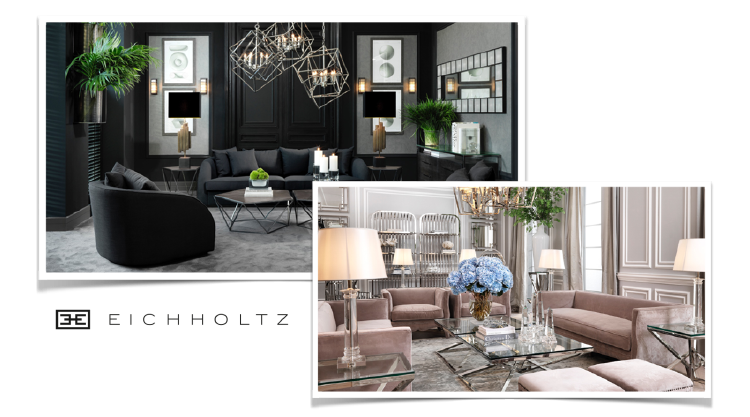 Jim Thompson were extremely fortunate to be given the opportunity to work with Eichholtz, a leading wholesaler of luxury furniture. 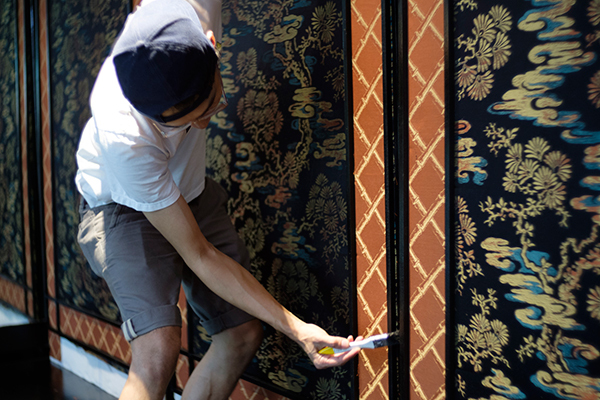 Their stunning pieces, upholstered in Jim Thompson fabrics, were admired by many of our visitors. While the staff in our showroom were busy welcoming scores of guests, our Creative Director Ou gave formal presentations of the new collections (Leo de Janeiro and Negresco) to our international teams, with separate presentations and exclusive interviews with both the European and Thai press. After a long but successful first day, everyone was in the mood to celebrate; Eric Booth (Jim Thompson’s Assistant Managing Director) hosted a drinks reception at his beautiful Parisian property. 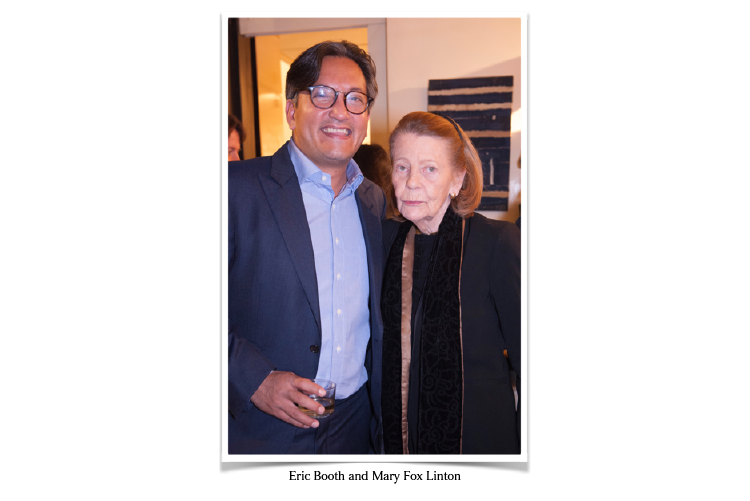 It was so special to have everyone celebrating together but our whole team would agree that it was Mary Fox Linton’s presence that truly stole the show. Mary is admired worldwide for her dedication to interior design, with a hugely successful career spanning over fifty years. Today she continues to oversee her popular textile brand Fox Linton, which designs exquisite luxury textiles. Fox Linton is famed for its beautiful plain fabrics, made using only the highest quality materials, usually incorporating silk and wool. Mary gave an emotional and extremely inspirational speech, leaving few dry eyes in the house. Visitors flocked to the showroom while the press meetings continued, and Ou and Richard presented their latest collections exclusively to the American team. In the evening everyone dressed up to the nines and made their way to the grand Hotel de Ville for the annual American Party, sponsored by Jim Thompson America. This extremely grand affair is dedicated to US companies and clients but welcomes a wide variety of brands, giving them the opportunity to network together over fine food and wine, and is also a great excuse to dress up. 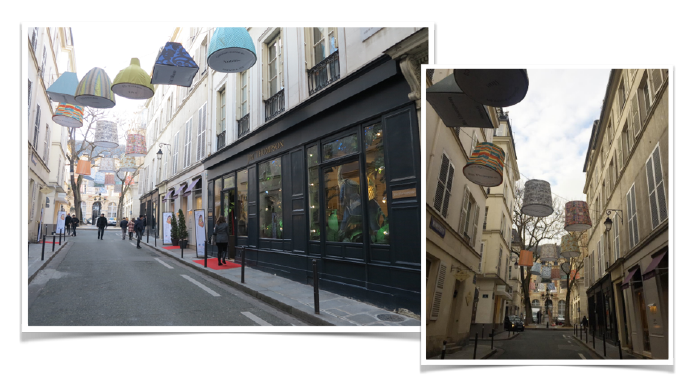 The celebrations continued on Saturday evening with Jim Thompson’s street party, hosted outside the showroom on the quaint Rue de Furstenberg. 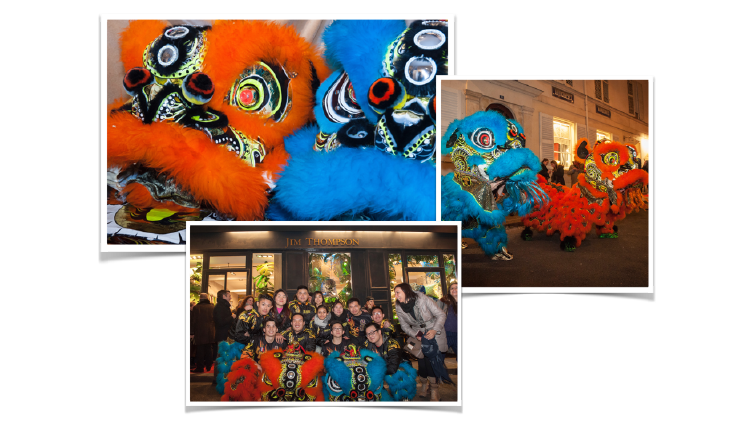 The Thailand team organised a splendid lion dance to celebrate the upcoming Chinese New Year and the new collection. 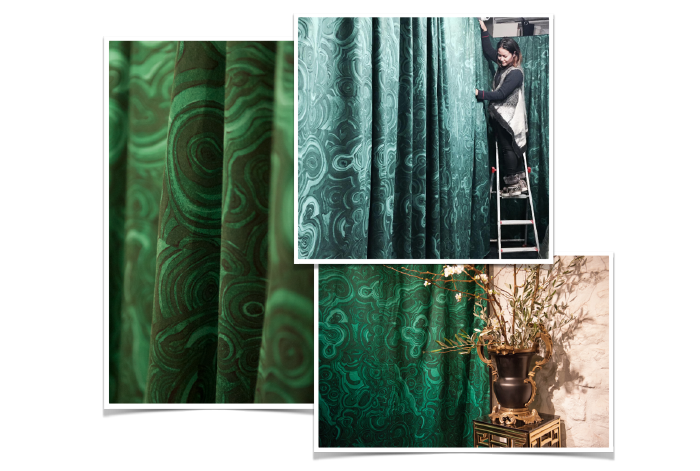 Leo de Janeiro is directly inspired by the iconic lion dance held worldwide for traditional New Year celebrations. The spectacle attracted an impressive crowd and was the perfect way to bring the story of Leo de Janeiro to life, and the event overall to a gradual close. Visit our Instagram for more photos from Paris Deco Off 2017. 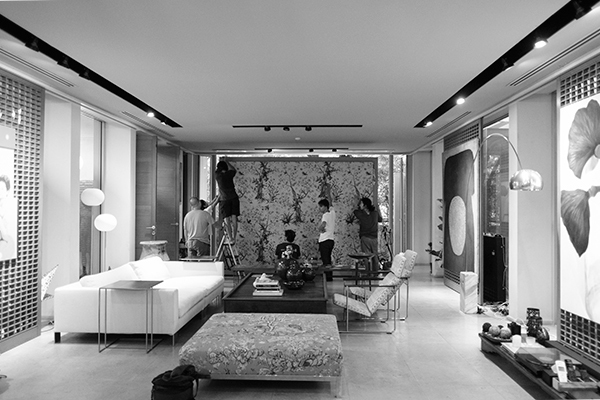 For the creative team at Jim Thompson, the shoot is one of the most exciting times. It is an opportunity to see all the hard work come together, from a concept and story, to the development and design, to finally becoming finished fabrics. The photoshoot also gives our Creative Director Ou Baholyodhin an idea of how the different fabrics, with their various colour schemes, patterns and compositions, will work in real application. This insight, achieved through the transformation of the collection into distinctive one-off upholstered pieces, elegant drapes and bold cushions, pulled together in a glamorous setting, is undoubtedly invaluable. 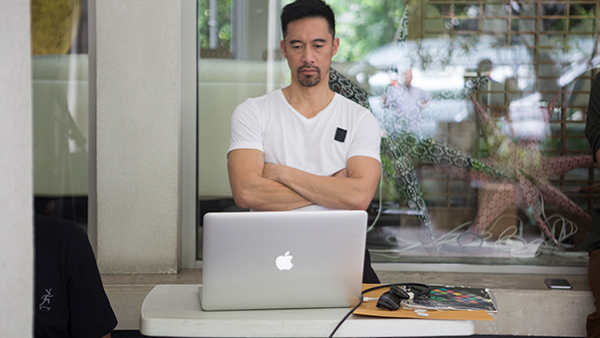 Ou Baholyodhin our Creative Director of Home Furnishings is always on hand, using his extensive design experience to give constructive suggestions, adjust a pillow or drape here and there, and taking time out of his busy schedule to oversee the project as a whole. Jim Thompson holds a photoshoot for every new collection, involving a concise team of talented photographers and style assistants and shot at an exclusive location. The site, once decided on, is furnished with fabrics from the latest collection; the space’s are always carefully chosen, architecturally impressive, striking and unique. The locations have to bring the collection to life in a beautiful way, both should compliment and inspire one another, which makes choosing the right space extremely important. This January, Jim Thompson launched two collections; Leo de Janeiro, inspired by the carnivalesque atmosphere and the iconic dancing lion at Chinese New Year; and Negresco, an outdoor collection inspired by the vacationing lifestyle of the French Riviera and the resplendent Hotel Negresco in Nice, France. See the new collection’s and further images from the photoshoot here.